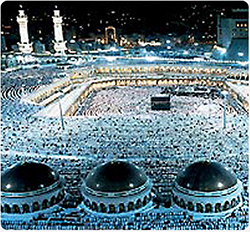 Saudi Arabia is the home of two of Islam’s holy sanctuaries: Makkah the Blessed and Madinah the Radiant. The Al-Aqsa Mosque in Jerusalem, enclosing the place from which the Prophet Muhammad ascended to heaven, completes the trio of venerated shrines in the Islamic world. To Saudi Arabia, caring for the holy cities of Makkah, the birthplace of Islam and the Prophet Muhammad, and Madinah, the Prophet’s burial place, is a sacred trust exercised on behalf of all Muslims. Recognizing the unique and historic tradition these holy sites represent, King Fahd bin Abdulaziz adopted the official title of the Custodian of the Two Holy Mosques as an expression of his deep sense of responsibility toward Islam. Saudi Arabia’s dedication to Islam is demonstrated by its superb maintenance and expansion of the holy sites, enabling greater numbers of Muslim pilgrims to perform the Hajj. This has always been an essential priority for the Kingdom. Every year funds from the annual budget are allocated exclusively for this purpose. The Ministry of Pilgrimage, in conjunction with other government agencies, oversees the annual logistical challenge of preparing for the Hajj and supports projects in the Kingdom and abroad that promote Islam’s role in the community. Beginning with the late King Abdulaziz, Saudi leaders have directed a series of ongoing projects aimed at improving the quality of accommodation, health care and other services for the pilgrims. An essential component of this policy has been the expansion of the Holy Mosque in Makkah and the Prophet’s Mosque in Madinah. At the time of Saudi Arabia’s unification in 1932, the Holy Mosque could accommodate 48,000 worshipers and the Prophet’s Mosque 17,000. A series of expansion plans, the latest of which was completed in 1992, increased the capacity of the two holy mosques to more than one million and over half a million, respectively. Under the personal direction of King Fahd, the work also improved the infrastructure and services necessary to enable the millions of pilgrims to carry out their religious observances in comfort and safety. This has included new airport and port facilities in Jeddah and other points of entry for pilgrims, roads to Makkah and Madinah, comfortable accommodations and an extensive health care network. It is an effort that is ongoing, with improvements each year that have included the installation of fire-proof tents and the provision of telecommunication facilities. As part of the Kingdom’s efforts to better serve Muslim pilgrims, whose numbers are expected to continue to increase, in 1993 King Fahd re structured the Ministry of Pilgrimage and Endowments into two separate organizations — the Ministry of Pilgrimage, which deals exclusively with the Hajj, and the Ministry of Islamic Affairs, Endowments, Call and Guidance. The vast financial and human resources Saudi Arabia has committed to the Hajj reflect the dedication of the leadership and citizens of the Kingdom to the service of Islam and the holy sites and to preserving them as a haven of peace for all Muslims.